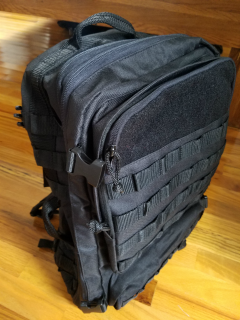 I got the Boulder Pack Co tactical backpack the other day in the mail to do a product review on and I wanted to say thanks to Boulder Pack Co for giving me the opportunity to review their product. When I received the package in the mail it was cool how small they got it packed into the box for shipping.When I took it out of the bag I was immediately impressed with the quality and durability of the material and I could tell this wasn’t just a cheaply made backpack. Being a US Army veteran I can really appreciate all that the Boulder Pack Co tactical backpack has to offer. Having a dependable durable backpack in the field is critical. The Boulder Pack Company Tactical Bag is ready to take to the field. At 40L capacity it can hold all your items and it’s durably built and includes a rain cover, water bladder compartment and plenty of MOLLE Style webbing for attachments. Practical features include a side carry handle, bands to hold excess webbing and removable waist strap. So after seeing this pack and all it has to offer I could not believe the very reasonable price. What a great value. I thought it would have been priced much higher. So all things considered I would definitely recommend The Boulder Pack Company Tactical Bag to everyone in need of a high quality dependable backpack. The only problem I’m having is my son wants it and I’m going to have to get another one for me. I film a lot of hunts and I am thinking about using this great backpack as a camera bag for all my filming equipment. It really is a high quality backpack at an unbelievable price. You can go check it out at Boulder Pack Co.